Whether you are an apartment dweller or own a large home in the country, cats make excellent companions and win over the hearts of many. Cats are adaptable creatures who can do well living in an apartment or roaming in the wide open spaces of the country. Be careful, though, because many cats have been known to steal their human’s hearts away and one to two decades of close friendship have been the result. For centuries, cats have been living alongside humans and the pairing has been one that works well, as the bond shared between cat and human is an affectionate and endearing one. Before adopting any animal into your life, there are some important things to consider. Cats have their own needs and quirks. Before bringing a cat home, consider some important things to ensure that it’s beneficial for the cat and yourself. Adopting any animal is a commitment and one that should be taken seriously. Ask yourself before adopting that adorable ball of fur whether you are ready to make a commitment to this cat for the next ten to twenty years. Yes, some cats can live to be twenty years old! Don’t adopt a cat with the mindset that if things don’t work out, you can just return him to the shelter or find a different home for them. This will place the shelter in a difficult situation, as there are already millions of stray and homeless cats filling up shelters across the country. Older cats are the last to be re-homed, as many people want kittens. Black cats and tortoiseshell cats tend to be adopted last, as these cats are often overlooked and the superstition of black cats being “bad luck” still persists in some areas. A cat is a commitment both financially and emotionally. You must make a commitment to the cat when adopting him or her that you will care and provide for him. Some cats may come with a few pesky antics that you may find annoying and this must be taken into consideration. Litter box issues, meowing loudly at night, scratching furniture, and possibly not being as affectionate as you would like them to be are all possibilities. However, these are also issues that can be worked out with time. If you think you aren’t ready for some of these issues, then perhaps adopting a cat isn’t right for you, or at least not at this time in your life. Like humans, cats have individual cat personalities of their own. An animal shelter can tell you a little about the cat’s personality, but as shelters are often crowded places, it’s impossible for a shelter to tell you exactly how the cat will be when you get them home. Some cats are affectionate while others prefer to be more independent and do things on their own terms. Some cats are more “outgoing,” meowing and “talking” to you. Others prefer to be quiet and spend their days kept to themselves. However, differences aside, you will find that all cats tend to have endearing personalities. These majestic creatures make a house feel more like a home. 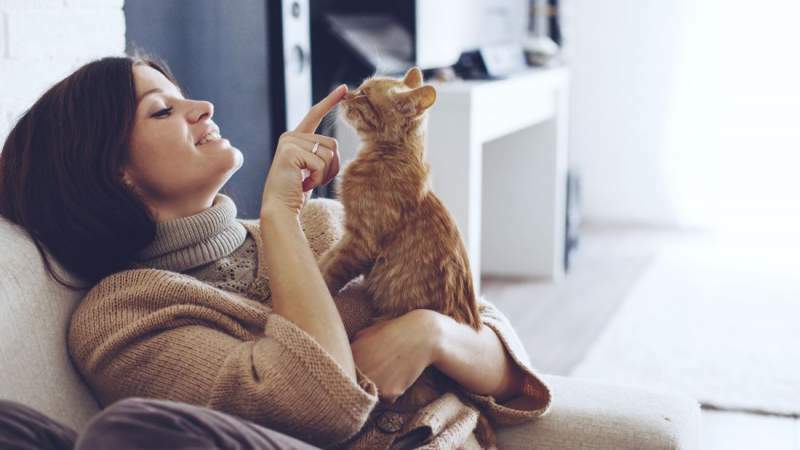 They also have a calming presence and research has shown that people who own a cat or a dog tend to live longer, as being around an animal lowers blood pressure and stress levels. From litter boxes, kitty litter, food, toys, and veterinary exams and vaccinations, owning a cat requires money. If your cat becomes ill, she will need to see a veterinarian. A vet may require that blood work and lab workups be done in order to help him diagnose any illnesses your cat may be experiencing. As they reach their senior years, cats can develop some common illnesses in older cats, such as diabetes, kidney disease, and hyperthyroidism. All of these illnesses must be treated with medication and ongoing veterinary care. You must carefully consider the cost of cat ownership. While these things can certainly add up, most cat owners would say that it is well worth the cost. A healthy cat generally doesn’t require a large financial commitment, as the cost of food and litter covers most of what the cat needs aside from an annual veterinary exam. If you adopt a cat from a shelter, many shelters will adopt the cat to you when she is already spayed or neutered and has had her first round of vaccines. Your initial cost will require purchasing toys, a scratch post, a little box, litter, food, and perhaps a cozy bed for the cat to sleep in. A visit to a veterinarian for an exam after adopting your cat is often required by many animal shelters and humane societies. If you plan to go out of town and travel, you can’t just leave your cat behind without any planning. You may need to hire a pet sitter to look after your cat during your absence, or have a friend or family member stop by regularly to check on them. If your cat becomes ill at some stage during her life, it will be harder to leave her for long periods of time. For example, it isn’t uncommon for senior cats to develop diabetes, hyperthyroidism, or kidney disease. If your cat were to develop hyperthyroidism, he would need to take a pill twice a day twelve hours apart. You would need to hire a pet sitter to come take care of your cat while you’re gone, ensuring that he doesn’t miss his medication. Cats require care such as grooming. Long hair cats, especially, require brushing every day to keep their coats free of mats, which can become painful. Many cats enjoy being brushed gently with an appropriate brush and this can be excellent bonding time between you and your cat. Many experts would tell you that declawing a cat is very painful for them and is inhumane. It is possible to leave their claws alone and choose not to declaw them, while training them not to scratch furniture. Cats have an innate need to scratch, so expecting them not to scratch at all is unreasonable. You must provide your indoor cat with scratching surfaces and train her to scratch them instead of furniture. Bringing a new cat home, you must expect that some furniture may get a little roughed up if you aren’t watching your cat closely. Expect to invest time and patience into your cat by showing her where the appropriate scratching surfaces are. She will get the hang of it, but it requires persistence and patience on your part. Indoor-outdoor cats can scratch trees and are usually satisfied with this. Carefully consider the lifespan of a cat before adopting one. This is a big commitment you are making. Some cats can live up to twenty years. On the other hand, some cats may not make it that long. Even healthy cats who are extremely well looked after can become sick once they reach their senior years, which is considered to be around age seven in cats. It can be heartbreaking to lose a cat, but bringing one into your life is well worth the pain of losing one. Many cats in shelters across the country are waiting for a loving, forever home. Opening your heart to a cat in need can be extremely rewarding and enrich your life in countless ways.